Acid: An acid is a molecule or ion capable of donating a hydron , or, alternatively, capable of forming a covalent bond with an electron pair (a Lewis acid).The first category of acids is the proton donors or Brønsted acids. In the special case of aqueous solutions, proton donors form the hydronium ion H3O+ and are known as Arrhenius acids. ACID (computer science): In computer science, ACID is a set of properties of database transactions intended to guarantee validity even in the event of errors, power failures, etc. In the context of databases, a sequence of database operations that satisfies the ACID properties (and these can be perceived as a single logical operation on the data) is called a transaction. 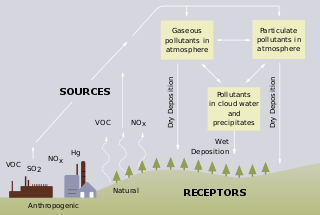 Acid rain: Acid rain is a rain or any other form of precipitation that is unusually acidic, meaning that it has elevated levels of hydrogen ions . It can have harmful effects on plants, aquatic animals and infrastructure. Acid dissociation constant: An acid dissociation constant, Ka, is a quantitative measure of the strength of an acid in solution. It is the equilibrium constant for a chemical reaction known as dissociation in the context of acid–base reactions. Acid house: Acid house is a subgenre of house music developed around the mid-1980s by DJs from Chicago. The style was defined primarily by the deep basslines and "squelching" sounds of the Roland TB-303 electronic synthesizer-sequencer.